Cheesy ham and potato casserole is a simple family favorite. This make ahead recipe uses leftover ham and russet potatoes, and has a creamy homemade cheese sauce. It's an all-in-one meal that shouts home cooked comfort. This recipe was originally published on October 20, 2017. Looking for a recipe to use up leftover ham? Our cheesy ham and potato casserole is just what you need. 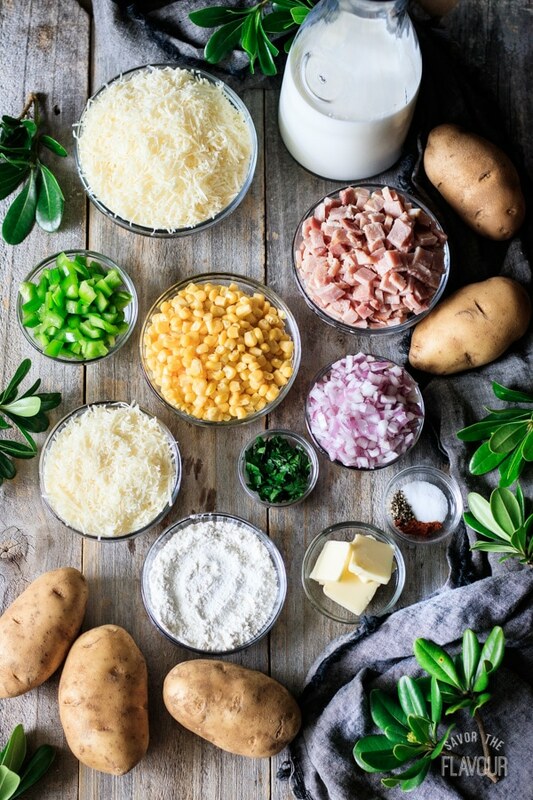 It’s main ingredients are potatoes, ham, cheese, and corn–all family favorites. I’ve been making this variations of this recipe for over seventeen years. My children love it, and yours will too. 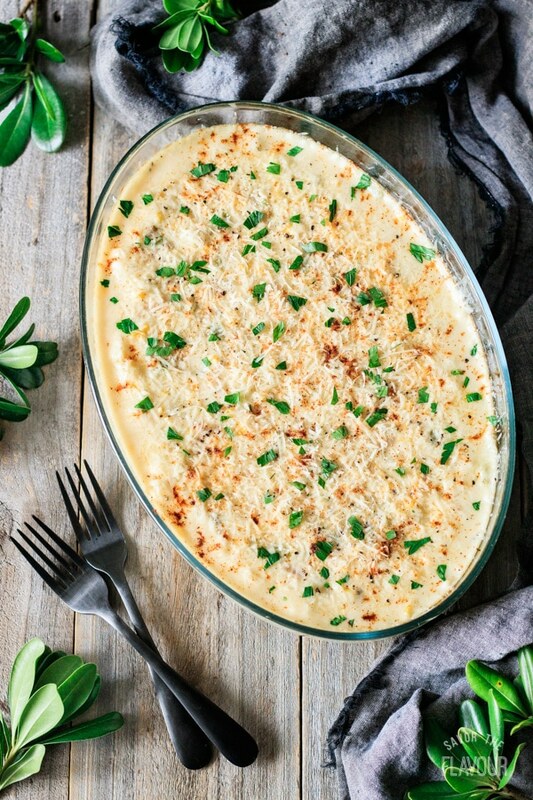 It has a creamy homemade cheddar cheese sauce that tastes amazing. This home cooked comfort food is an all in one meal and isn’t expensive to make–ideal for weeknight meals. What are some common substitutes for ham and potato casserole? How can I tell if the cheese sauce is done? It will have no lumps, due to gradually adding the milk while whisking. It will start to thicken after stirring for 10 minutes. It will coat the back of a spoon. First, gather all the ingredients. Cube the ham, grate the cheese, chop the onion, green pepper, and parsley. 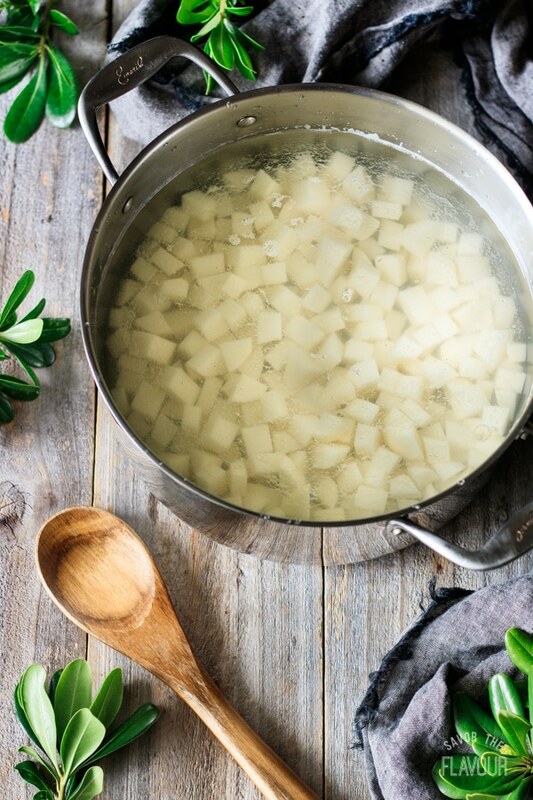 Rinse, peel, and cut up the russet potatoes into small pieces for faster cooking. Place in cold, salted water. Bring the covered pot to a boil. Simmer for 10 to 12 minutes or until fork tender. Drain, then add back to the pot. Saute the red onion and green bell pepper until soft in a small skillet. Add to the cooked potatoes. Melt the butter and add the flour one tablespoon at a time until the desired consistency is reached. Cook the flour for 3 minutes, whisking constantly. 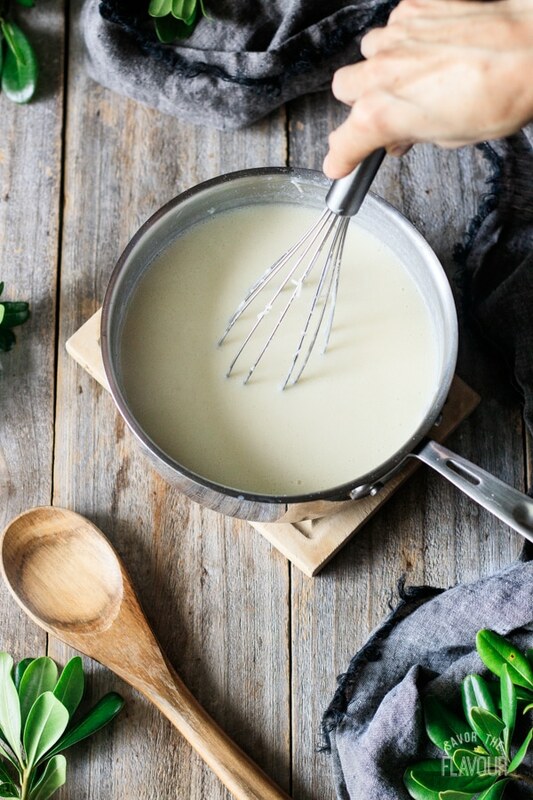 At moderate heat, gradually add the milk, whisking constantly to achieve a smooth sauce. Keep whisking until the sauce thickens, about 8 to 10 minutes. Lower the heat and gradually add the cheese. 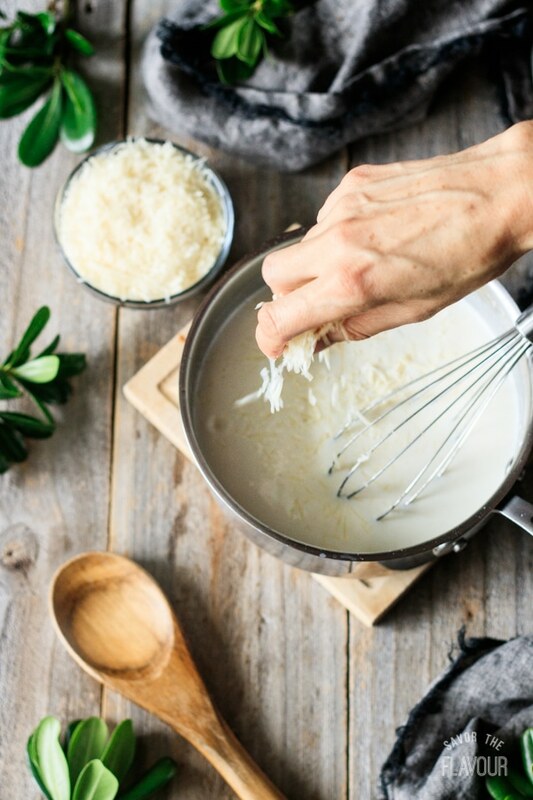 Whisk until the sauce is smooth and all the cheese has melted. Remove the cheese sauce from the heat. Pour over the potatoes, corn, ham, onions, peppers, and spices. Pour into a casserole dish. (If you want to make it ahead, you’ll cover the dish and put it in the fridge at this step.) When ready to serve, cook for 30 minutes at 350 F or 20 minutes at 400 F if you’re in a hurry. Garnish with freshly grated Parmesan cheese and fresh parsley. Allow to set for a few minutes, and serve warm. Peel and dice the potato in small even chunks to speed up the cooking. Whole milk works better than 2% for the cheese sauce. Use freshly grated cheese, not pre-grated. 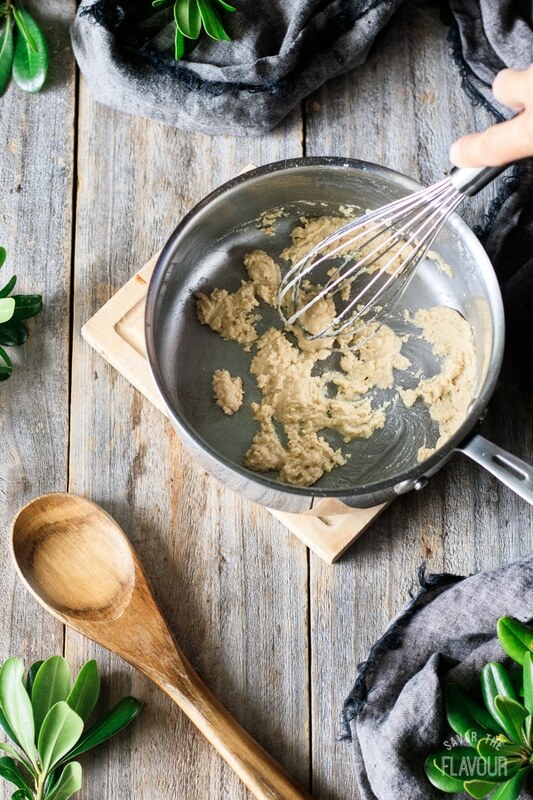 Add an extra tablespoon of flour to the roux for a thicker cheese sauce. As the potatoes bake, they will absorb some of the cheese sauce. Allow to set for a few minutes before serving. Cooking for a crowd? It’s easy to double. Make Ahead Tip: make the day before then just before serving, bake for 30 minutes and garnish. I encourage you to make this for supper tonight for your loved ones. 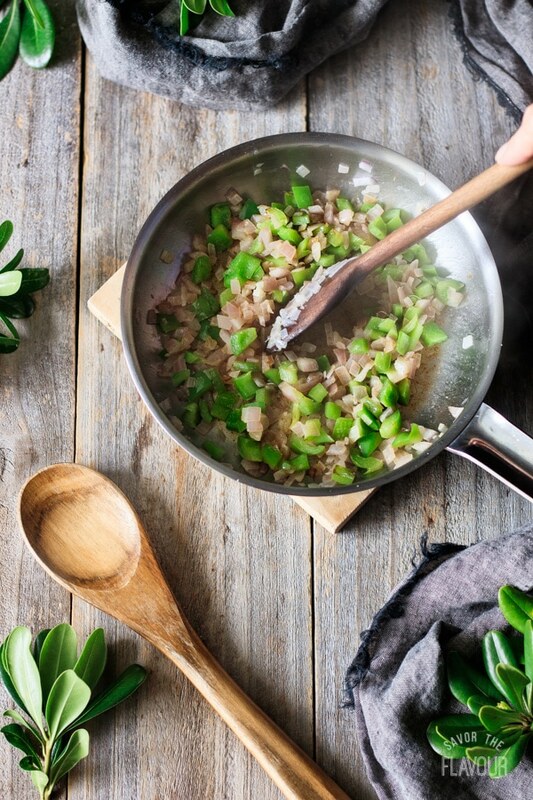 Be prepared to add this recipe to your master list of suppertime favorites. It’s a fantastic way to use up leftover ham. Craving more ham and potato recipes for your collection? Try these tried and true family favorites. Smoky Cheese, Potato, and Ham Soup: a rich smoky flavor makes this creamy soup a gourmet treat. Cheesy Ham and Potato Pie: layers of potatoes, ham, and cheese sauce make this pie a comfort food dinner idea. Did you make this cheesy ham and potato casserole? We would love it if you left a star rating and comment below. It would make our day! Cheesy ham and potato casserole is a simple family favorite. This make ahead recipe uses leftover ham and russet potatoes, and has a creamy homemade cheese sauce. It’s an all-in-one meal that shouts home cooked comfort. Peel and cube the potatoes. 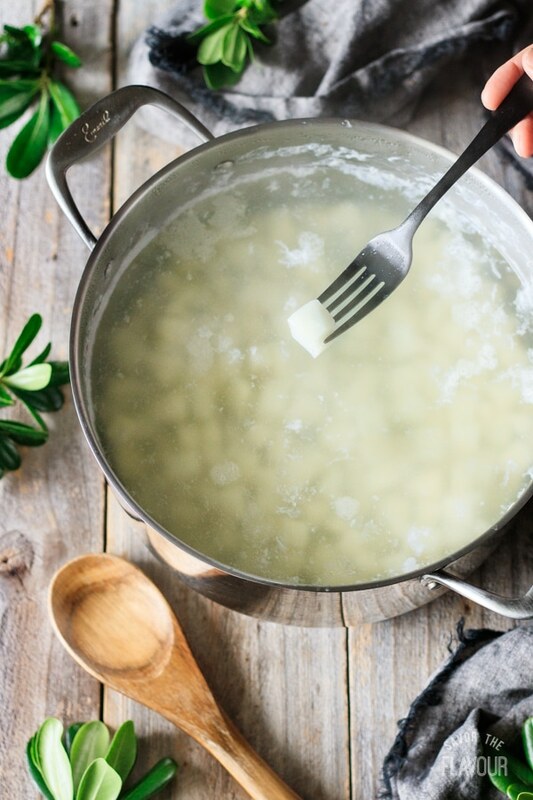 Place the potatoes in a large pot of salted water and bring it to a boil. Cook the potatoes until fork tender, then drain. While the potatoes are cooking, cut up the ham, green pepper, and red onions. Saute the green peppers and onion in butter until soft. 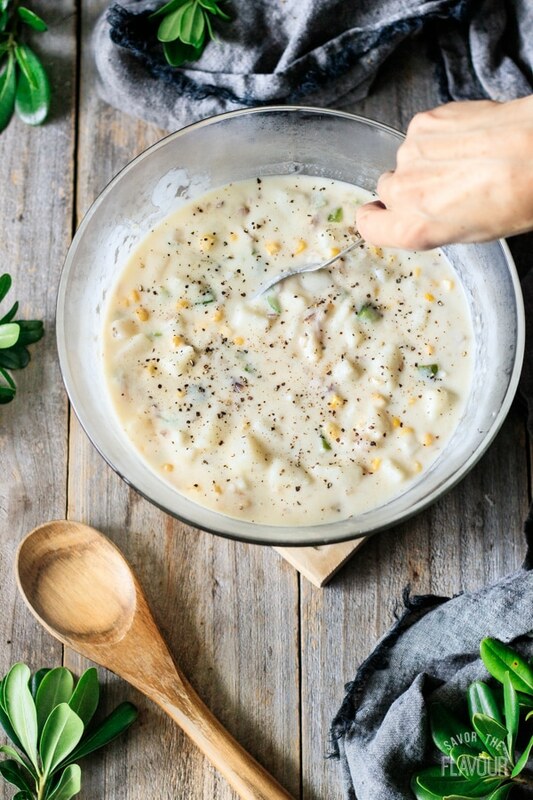 Gently stir together the potatoes, peppers, onion and corn in a large bowl. Melt 2 tablespoons of butter in a medium saucepan over medium heat, then add the flour 1 tablespoon at a time. Cook for 3 minutes, whisking constantly. 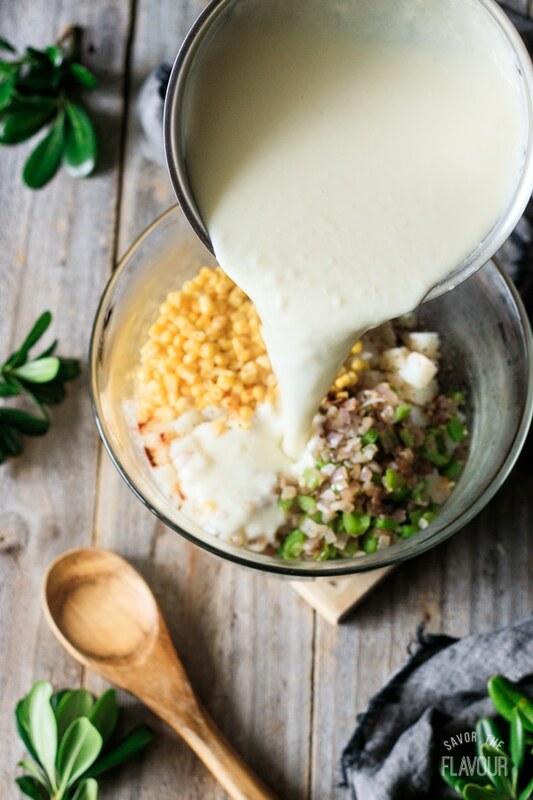 Gradually add the milk, constantly whisking until the sauce is smooth. Cook until it thickens, stirring occasionally for 8 to 10 minutes. Reduce the heat and stir in the cheese until melted. Remove the sauce from the heat and mix it into the potato mixture. Adjust seasonings to taste. Pour the cheesy potato mixture into a large casserole dish. Top with 1 cup of cheddar cheese, and smoked paprika if desired. Bake in a 350 F oven for 30 minutes. Allow to set for a few minutes, then serve warm garnished with fresh parsley, freshly grated Parmesan cheese, and a few cracks of black pepper. This casserole freezes well. Thaw it out overnight in the fridge, then reheat it in the oven at 300 F for 30 minutes. Garnish with a fresh sprinkle of cheese and paprika on top.